A Topic for the Thanksgiving Dinner Table: Who Is Really Pro-Family? The next time a political conservative tells you that they are more family oriented than progressives (with their damn marriage equality nonsense!) ask them where they stand on stores opening Thanksgiving? 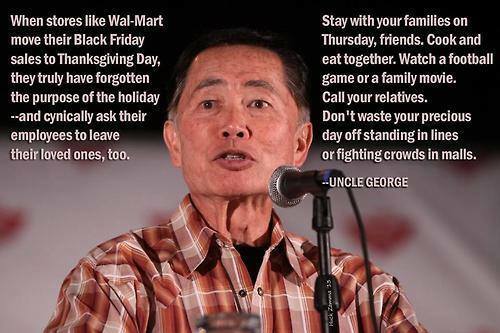 They’ll probably tell you stores should have the right to be open but people are not obligated to go shopping. Being “pro-family” and “pro-business” demands that one to follow the same kind of logic that creates corporations like Wal-Mart that have to organize food-drives for their under-paid employees. If that makes sense to you, you are not pro-family, you are really pro-Me: whatever social and cultural practices leave ME comfortable with my point of view, whatever makes ME richer, laws that allow ME to do whatever I want regardless of the impact of my actions on others.